We offer you an exclusive range of Wrought Iron Mirrors crafted from the finest quality iron. These Wrought Iron Mirrors manufactured by us are corrosion resistant and highly durable. These are a unique wall decorative and can surely enhance the appearance and beauty of your office or house decor. The range of Wrought Iron Mirrors set offered by us is widely appreciated across the nation. Available in metallic colors and diverse sizes with oval and rectangular shapes these are polished with great care to offer a dazzling finish. Grace your room with the traditional styling of the handpainted Wall Mirror. Handcrafted, wrought iron wall mirror enhances your decor with elegant, openwork scroll designs and a heart and fleur design at the top. 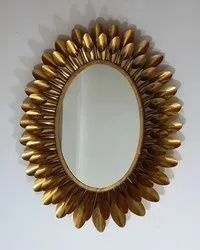 Being one of the reputed organizations in the market, we are engaged in offering an exclusive array of Wrought Iron Mirrors. The complete range of iron mirror is designed by using finest grade material and ultra-modern technologies. This iron mirror is made available in different designs to suit variegated needs of customers. 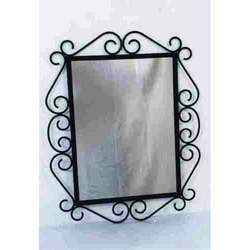 Backed by vast industry proficiency and understanding of this realm, we offer a wide series of Wrought Iron Mirror. In line with clients’ different necessities, we provide this product in different specifications. Wonderful! Beset with natural patterns, these mesmerizing wrought iron mirrors in oval shape are great to be placed above the vanity.